Sepp Blatter (L) and Michel Platini. Experts provide an analysis of the former FIFA Chief Sepp Blatter’s recent comments, and their likely impact on FIFA’s future and the destiny of Russia’s World Cup. The recently suspended FIFA President Joseph (Sepp) Blatter has made sensational statements about how host countries were selected for the next two world championships, in interviews with the Russian news agency TASS and the Financial Times. The 79-year-old said that a gentleman's agreement had been concluded, according to which the 2018 and 2022 World Cups would be given to the two world superpowers, Russia and the United States. Blatter believes that if this arrangement had been successful, he would have retained his post. However, since the choice of the United States for the 2022 World Cup was blocked by then French President Nicolas Sarkozy who, according to Blatter, put pressure on Union of European Football Associations (UEFA) chief Michel Platini to vote for Qatar. In the final vote, Qatar beat the United States 14-8. Several experts were asked to give their opinions. "During a campaign such public blows are especially dangerous. Now FIFA's ethics committee is unlikely to allow Platini to run for the FIFA presidency on February 26 (2016). Blatter is taking revenge against Platini, for what he believes is his planned action to mitigate the influence of FIFA and strengthen the role of UEFA. "According to the Swiss, in mid-2014 Platini hoped to take control of all federations from FIFA and to transfer these rights to the respective continental bodies (UEFA, CONCACAF, CAF...). In this case, FIFA would have lost all administrative power." What will happen to world football? 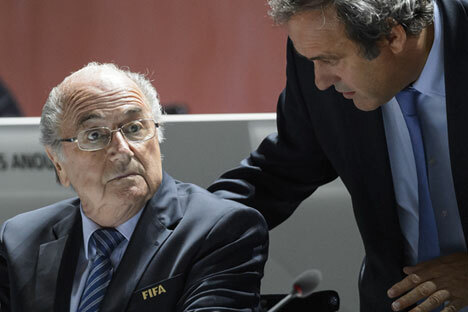 "If the FIFA's Ethics Committee allows the election of Platini, he will definitely win, despite all the scandals. It would be logical. The organization needs a strong successor. I have spoken to Platini many times and seen him in action. From a great player, he has turned into a serious administrator. Platini is the only person in the world who can return world football to its normal course. "The second scenario is that Platini will not be allowed to stand in the election. Then the fight will be between UEFA General Secretary Gianni Infantino and Prince Ali bin al-Hussein of Jordan. In the case of Infantino's victory, the centre of power would shift even more toward Europe. "If Prince Ali wins, the position of the UEFA, on the contrary, would become weaker. The Prince of Jordan would most likely want to reduce the number of seats of the European countries at the World Cup and give them to Africa and Asia. This would entail another clash between FIFA and the UEFA." How will revelations influence the world championships in Russia and Qatar? "Blatter talks about diplomatic agreements within FIFA, yet representatives of the Russian organizing committee are not mentioned. And even if someone directly concluded this 'gentleman's agreement' with the members of the executive committee, football officials will be the first ones to be punished. "Qatar is also out of danger. For this, direct evidence of corruption should be collected. There have been several investigations, but so far everything is guesswork." Will new FIFA scandal hurt Russia’s Cup?